Nothing like a good book, good wine and off you go to 1954 Paris! Sounds like your kind of read? Then join us in this Q&A, with bestselling author Antoine Laurain giving you a taster of the wonders that await in his new wine fuelled novel splashed with an unforgettable time travel experience: it’s called Vintage 1954. Sit down, relax and à votre santé! Describe this book in one sentence. You drink a glass of wine from a 1954 bottle and you wake up … in 1954! Imagine that time travel experience. What inspired you to write Vintage 1954? I often look at old photos of Paris, particularly those by Robert Doisneau – black and white images of a bygone France, a France I’ll never know … I think I wanted to step into one of those photos and have a walk around inside it. There was a kind of charm to those years that has been lost. Which is your favourite moment of the novel? Maybe the chapter in which the four main characters go for dinner at Les Halles. I had to recreate the atmosphere of the original glass halls and of the neighbourhood, which has changed beyond recognition. When I finished the book, I sent it to a wine merchant friend of mine to check. He sent back a few corrections, along with a bottle from his personal cellar, with a note saying, ‘I can’t believe what you’ve written, Antoine! The wine and the flying saucer over the vines – it’s an actual thing!’ The wine in question is American and the label shows … a flying saucer above a French vineyard! 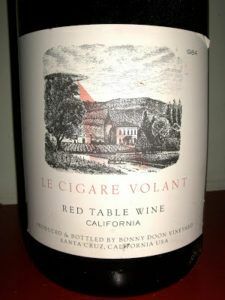 If you type ‘le cigare volant wine’ into Google images, you’ll understand how surprised I was to see it – I had no idea this wine existed. What is the message of the novel? Each character has to discover something about him or herself – their role in life, you could say. Going back to the 1950s for the weekend helps them find the answer. It’s also a story about friendship. If you could time travel, where would you choose to go? Most of your novels develop around an object (a hat, a notebook, a cassette, etc). Why did you choose wine this time? I was trying to think of a way for the characters to go back in time. While I was cooking at home, I started looking at the old empty bottles I’ve got displayed on a shelf in the kitchen, with the dates on their labels : 1971, 1988 … It struck me that this could be the ‘magic potion’ : a bottle of wine and the date on it! Paris is a city with a fascinating history. Why did you decide to take your characters back to 1954 in particular? Because there was a wave of UFO sightings in France that year, and that’s one of the keys to the story. What’s next for Antoine Laurain? I’m writing a new novel. It’s different from Vintage 1954, but in a good way. The latest Michel Houllebecq, Serotonine. Antoine Laurain is the author of the bestselling novels The President’s Hat and The Red Notebook translated to more than 20 languages. Vintage 1954 is out July 2019.